Do you have to pay more for service? Absolutely not! Hogan’s General Store offers a truly special Butcher Shop experience. Our butcher cuts fresh steaks, trims and ties roasts, makes fresh kabobs, and prepares stuffed chicken breasts and pork chops fresh and available right out of our full-service butcher case. Visit our butcher case where we are proud to offer all natural premium fresh beef, poultry, all natural pork and seafood. We are very proud of our Heartland Farms All Natural Beef, which is raised and corn fed by a select group of Midwest farmers. All our beef is farmer fed with high quality grains the way nature intended. 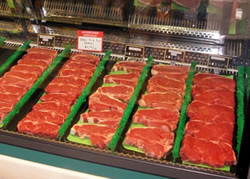 Heartland Farms All Natural Beef is processed under USDA Inspection for the highest quality and safety standards. At Hogan’s General Store you can trust that we do not sell any beef purchased off the “open market”. All our beef is available only in grades Choice and Prime. Raised by certified growers.